OK, spoilers ahead, though if you haven’t read Batman and Robin #17 yet, you should. It’s been out for a week after all. Anyway, this is the first issue since writer Grant Morrison left to focus on the excellent Batman Incorporated. By Paul Cornell and Scott McDaniel it’s a return to fun, mystery and those intriguing and scary moments that the best Batman comics do so well. The last page, shown below, is the debut of a new villain, or villainess called Uno Nemo. Not related to Finding, I assume the name will mean something, but she has an interesting feature, or lack thereof. Where she keeps her brain, who knows? Maybe she’s an android. 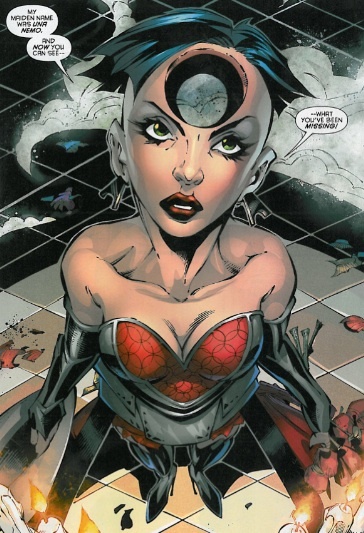 She does remind me of Dudley Soames, a crooked cop in Nightwing’s solo series back in the day who had has head twisted around 180 degrees by Blockbuster, survived, changed his name to Torque and went about his criminal business, with his head on the wrong way. Great stuff. My bet is that the following three things will happen with this new character. 3. Robin will throw a small projectile at her face, and it will go right through the hole in her head. Time will tell. Great bad girl though. Boy that’s a long title. Sure is some perty art though. Text-free preview below of the comic which hits digital and print stores on the same day in January. Marvel is pleased to present your first look at Ultimate Comics Captain America #1, from the acclaimed creative team of Jason Aaron and Ron Garney (Wolverine: Weapon X)! 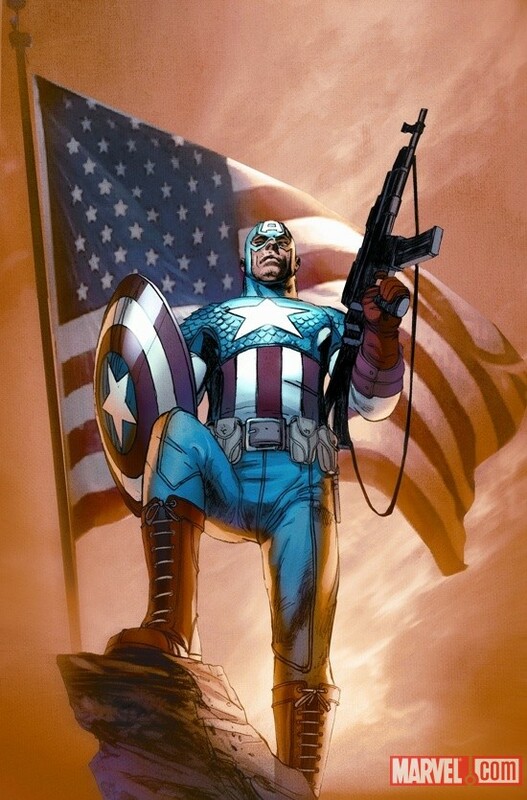 The Super Soldier project was a secret and mysterious undertaking that took a frail young man named Steve Rogers and forged him into the Captain America of World War II…but Rogers wasn’t the only one to emerge from the program. 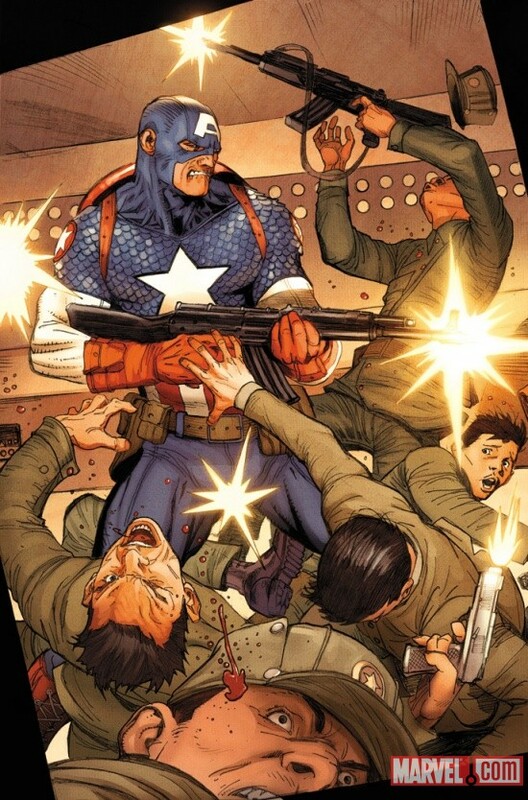 Enter the Captain America of the Vietnam War! Prepare for a battle between two Captain Americas…and only one living legend is walking away! 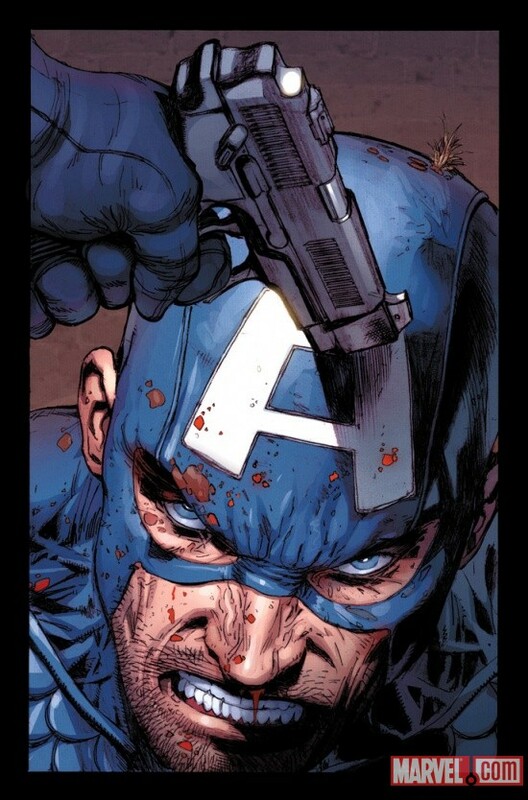 Ultimate Comics Captain America #1 hits stores and the Marvel Comics app on January 5th! As I’m impatient I usually order DC’s excellent animated films from America as it takes us a long time to get them here in Oz. However the great animated films like Green Lantern: First Flight, Superman/Batman: Public Enemies, etc are now readily available here which is great news. Now I’ve just (accidentally) discovered that the Marvel Knights Motion Comics will be available at JB Hi-Fi stores around the country from December 1. Hopefully they’ll promote them more for the Christmas shopping season. Based directly on respected runs within the Marvel comics these mature and great looking films are all $30 and on DVD and Blu-Ray. These are very high quality fluidly animated films that really bring the original art to life. 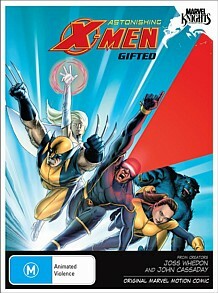 The titles are Astonishing X-Men: Gifted (by far the best one, based on the work of Joss Whedon and John Cassady), Spider-Woman: Agent of S.W.O.R.D, Iron Man: Extremis and Black Panther. All are visually different and a great intro to the characters and comics themselves. There’s no mention of the special features but I assume, like the U.S versions there will also be trailers, interviews and the like. Check them out here and some of the motion comics in action here. 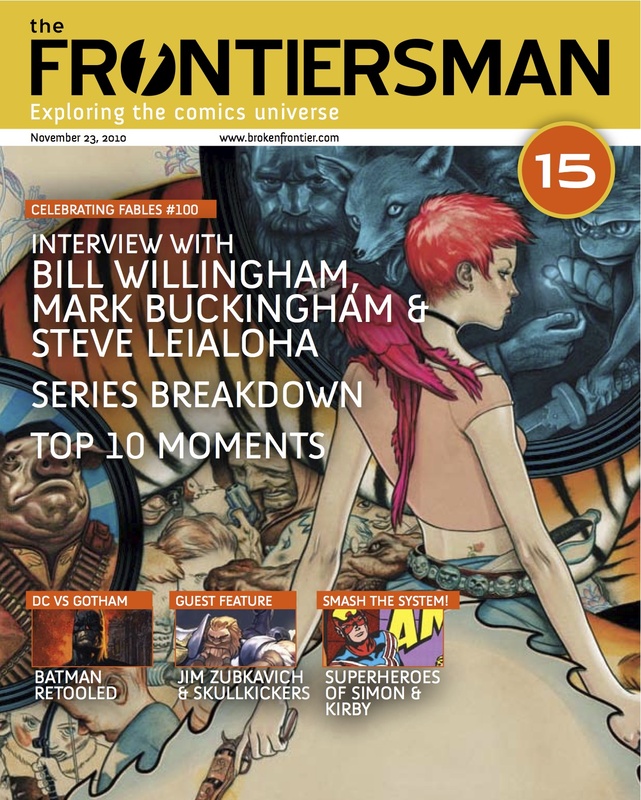 Co-edited by yours truly is the latest, FREE issue of the digital Frontiersman magazine. Get it at Broken Frontier. Inside its 46 pages is a feature on Fables and an interview with its creators, writer Jim Zubkavich on his great and popular Skullkickers, a look at Superboy’s history, an exclusive preview of January’s Who Is Jake Ellis? from Nathan Edmondson and Tonci Zonjic, and more. Jennifer Byrne presents this special on graphic novels, or if you prefer: comics, picture books, Illustrated fiction or sequential art narrative. To discuss the wonderful combination of words and images, we are joined by special guests Eddie Campbell, Sophie Cunningham, Burce Mutard and Nicki Greenberg. Eddie Campbell, the artist on From Hell written by Alan Moore, has the most interesting things to say, but it’s great to see local creators get some exposure, and I must give ABC much respect for giving a half hour primetime show devoted to comics. Want something to distract you in between bouts of reading comics? How about games based on comics, then? 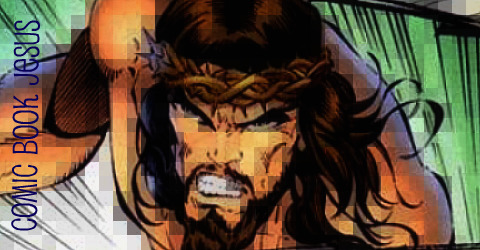 Three different comic publishers have all made launches within days of each other. First up is Papercutz with their first of many games based on The Smurfs. Smurftastic news! Papercutz, the premier publisher of such popular graphic novel series as BIONICLE, DISNEY FAIRIES, GERONIMO STILTON, NANCY DREW, TALES FROM THE CRYPT, and THE SMURFS has posted the first of three all-new Smurfs games on its website. “Brainy’s Bad Day” is now available to play at www.papercutz.com/smurfs. Papercutz will post more free games in the following months. These games can be played online and on any Flash-enabled phone with a web browser. Recently, Capcom launched its iPhone game “Smurf Village” which quickly became the most popular game on the Apple iPhone App store. 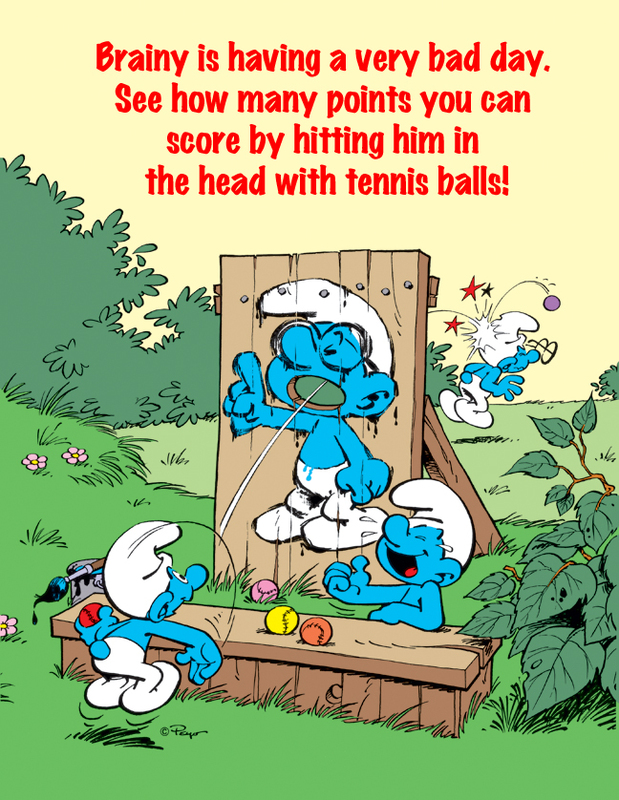 “Brainy’s Bad Day” lets you take on the role of a mischievous Smurf attempting to bean Brainy with a tennis ball. You have 30 seconds to score 10 points and move on to the next round. For extra points, try to bop Brainy as he walks through the woods. Highly addictive and great for all ages, “Brainy’s Bad Day” is easy, free, and more fun than a barrel of smurfberries! Radical Publishing’s game based on their sci-fi Shrapnel series has the most potential to please serious gamers. Gamers take on the role of Vijaya “Sam” Narayan, a former military hero, who is fighting to save the galaxy from the Solar Alliance. Gamers navigate Sam and the Alliance across multiple planetary terrains, battling enemies, all while unlocking secret missions and compiling money to purchase weapons and upgrades. During game play, players also accrue points to stay atop of the leader board in hopes of winning cash prizes. Unlike other games, this dual stick shooter is based on an intelligent engine that modifies game difficulty based on the player’s ability – perfect for the novice or expert player. The 3-D graphics and sound effects make game play realistic and engaging. “Once you start battling enemies, it is hard to stop playing … the game play is very addicting.” stated Barry Levine, President of Radical Studios. “Our partner, Moyo Studios, has created a fun and challenging game that immerses casual gamers inside Sam’s world”. For a limited time, Shrapnel is available for $.99 at the Apple App Store. Lastly, BOOM! Studios have released a new game based on their new Stan Lee’s The Traveler comic. Alongside the much anticipated release of the time-bending superhero saga STAN LEE’S THE TRAVELER #1, comes the debut of STAN LEE’S THE TRAVELER in SPLIT-SECOND MAYHEM available now in the iTunes store for the iPhone & iPod Touch and brought to you by Stan Lee, BOOM! Studios, GameSalad, and D7! In this fast-paced puzzle game, you play as The Traveler battling against the Split-Second Men to defeat evil and save the future! Speed up or slow down time to navigate citizens through perilous traps and dangerous encounters with the Split-Second Men. Straight from the pages of STAN LEE’S THE TRAVELER, SPLIT-SECOND MAYHEM makes you the hero and puts you in control of the adventure! It’s been too long since I’ve done one of these, but here’s the best new comics I read this week. It’s a week of endings, as Kevin Smith’s run on Green Hornet finishes, as do Batman Beyond and the great Ghost Projekt from Oni Press. I realised last month when two of writer Tom Taylor’s Star Wars issues came out on the same day (Blood Ties and Invasion) how good a scribe he actually is. Of course I (and many others) already knew that, but the diversity and consistency with which Taylor approaches the material is impressive. Star Wars at its best has always managed to successfully blend epic life or death adventures with more light-hearted cheekiness. While Invasion centres more on the serious side of things this entertaining mini-series is all about the cool, “oh yeah!” moments that made me recall the thrilling escapism of the original trilogy. Both Invasion and Blood Ties could almost be written by two different people; both of them good. However, Taylor is just one man with the seeming ability to switch writing brains with skill. This final issue of Blood Ties is hung upon a resonant question spoken on the first page, ie, “How do you make a dead man proud?” With Boba Fett getting to know his travelling companion/hostage/bounty, Connor Freeman and the link the two men share even more, this has been a series with cheeky action and dramatic dialogue, and even humour at the expense of the ever dwindling “league” of bounty hunters (now just one angry man). With Chris Scalf’s exquisite renderings adding much visual panche, this is like old-school Star Wars with a sense of fun and menace and it helped me forget the mediocre Force Unleashed II game. You can see Scalf at work here. This was worth the wait, even though this long-promised series doesn’t actually start until February. This primer is a solid intro to the latest spandex wearer in the Bat family. Told solely, and well, through narration this issue is only 16 pages long with a 4 page sketchbook by writer/artist J.H Williams III, who showed fans what he could do with the character in Batwoman’s run in Detective Comics. 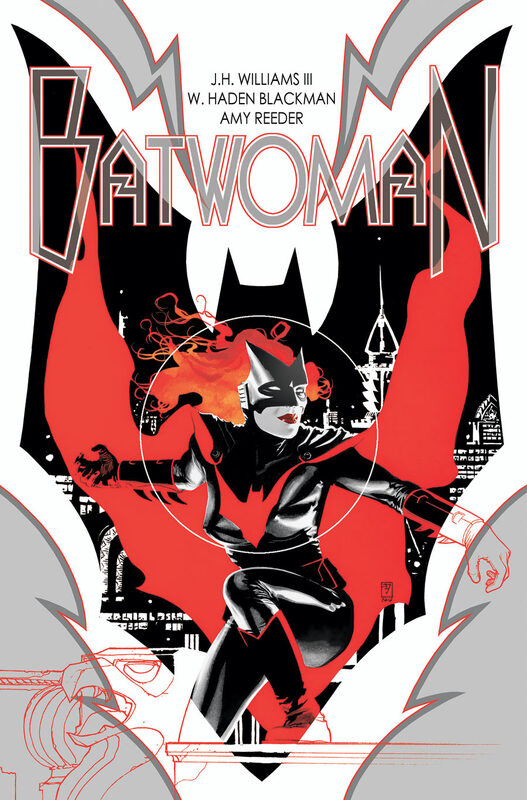 With co-writer Haden Blackman, Williams forges a sharp, focused story which gives the reader all the info they’ll need on the red-haired crime fighter, as Batman tails her to confirm her identity as Kate Kane. With dynamic action scenes and an absolutely luscious visual style rarely seen in spandex books, this is a must get. Amy Reeder’s more cartoony artwork runs parallel to the Batwoman sequence with a look at Kane’s civilian life. Williams never lets this story telling device get out of control and it’s fluid and easy to grasp all the way. 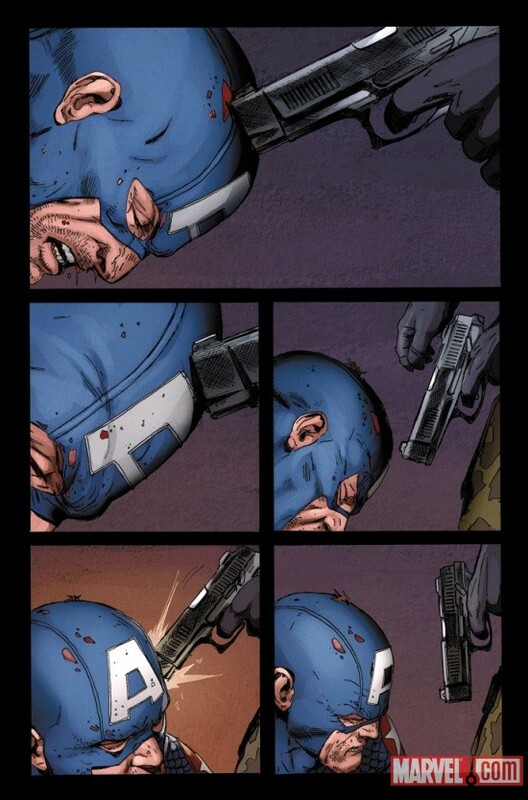 Plus, he throws in some dynamic page layouts that remind us of the power a comics page can reveal. I’m not a regular reader of this series, and haven’t read the issues before this, but it was fairly accessible and filled with intriguing ideas. Part 1 of the aptly named Quarantine arc by Matt Fraction and Greg Land, it tells of a virus working its way through the mutant population of the island Utopia. Meanwhile an uneasy team consisting of Emma Frost, Kitty Pryde and Fantomex have captured Frost’s former mentor Sebastian Shaw. Two other parallel tales tell of an Asian mutant in what looks like a patriotic gymnast’s outfit using words like, “collective,” “comrade” and “capitalist,” as he scares Chinatown into doing things his way and a new drug that allows humans to become powerful mutants, with a nice payoff at the end showing 5 new versions of the founding X-Men. Fraction’s streamlined plot and Land’s realistic pencils combine for a dramatic and dangerous story.